Stems: Erect, widely branched from bases to just above mid-stem, covered with stiff-hairs. Leaves: Alternate, simple, sessile, linear to linear-lanceolate, .5 to 1.25 inch long, less than 1/8 inch wide, grayish stiff-hairy; margins entire, rolling under; tips taper to points. Inflorescences: Solitary flowers or terminal cymes, in leaf axils. Flowers: 5-parted; calyces deeply divided almost to base, lobes long-pointed; corollas 5-lobed, funnel to bell shaped, about 1/4 inch long, lavender; stamens 5, unequal in length, less than 1/2 as long as corollas, bases of filaments expanded into minute, free-margined appendages. Fruits: Capsules; seeds 40-50, tiny, yellow. 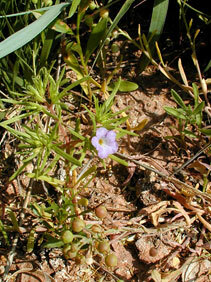 Habitat: Open sites in sandy, gypsum soils. Comments: Stevens' nama occurs only in south-central counties bordering Oklahoma.